Sixth District Congressman Bob Goodlatte announced on Monday that he is endorsing Harrisonburg State Sen. Mark Obenshain for the Republican attorney general nomination. 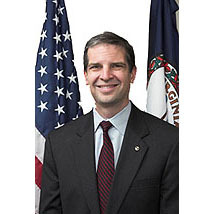 Obenshain is running against Charlottesville Del. Rob Bell for the GOP nomination for attorney general. The party will decide on its nominee at a convention in May!. “Not only do I know Mark on a professional level, but I have had the privilege of calling him a close, personal friend for many years. From listening to his ideas about new and innovative plans for the future of Virginia, to witnessing firsthand how effective he is as a state senator, to sharing his conservative values, I can say without reservation that he will make a great attorney general,” said Goodlatte, who was elected to an 11th term representing the Sixth District in November. “Mark is both an accomplished legislator and an acclaimed attorney, so he understands very well just how important the position of Attorney General is to the Commonwealth of Virginia. One of the founders of the Virginia-based law firm, Lenhart Obenshain PC, Mark has represented Virginians for over twenty-five years on a broad range of issues. I have had the unique perspective of getting to know him at this professional level as a fellow Virginia attorney myself, and cannot think of a more principled and experienced conservative to tackle the issues that face our great state in the future,” Goodlatte said. “A large part of the attorney general’s job is working with the General Assembly to develop legislation that makes our Commonwealth a safer place. One of the most effective state senators I have worked with, Mark Obenshain has been a leader in supporting law enforcement and championing tough legislation that has cracked down on criminals. I know that this commitment to the safety of Virginia families finds its roots in Mark’s dedication to his own, wonderful family: his two children, Anne Tucker and Sam, and his wife Suzanne. “There is no person more dedicated to securing our liberties than Mark. It is an honor to give a whole-hearted endorsement to my dear friend Mark Obenshain for Attorney General. The next few weeks are a critical time to solidify support around Mark, and he is going to need our help,” Goodlatte said.